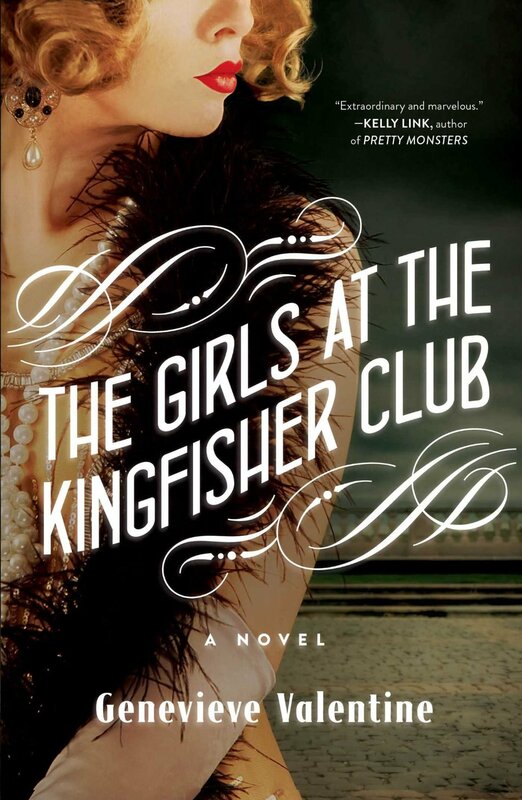 The Girls at the Kingfisher Club is a reimagining of the fairy tale The Twelve Dancing Princesses set in 1920s New York city. It features twelve lovely and lively sisters, their miserly and evil king-like father, speak easies, bootleggers and flappers. The girls’ mother has died and dad, disappointed in having no male heir, has kept his girls imprisoned their entire lives in the upstairs of their Fifth Avenue house. Mr. Hamilton is a shrewd businessman but terrible father. Oldest daughter Jo, in order to prevent second daughter Lou (her closest friend) from running away, proposes sneaking the older girls out at night to dance. 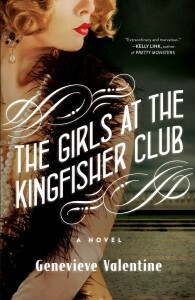 Over the course of 8 years, all the daughters reach the age to go out dancing and their haunt of choice is the Kingfisher Club. … the Kingfisher was small enough to be out of mind and dark enough to slip into; there were faces of all colors on the dance floor and sometimes two men cheek to cheek, and she wanted a place that could keep secrets. Never tell a man your name. Never mention where you live, or any place we go. Never let a man take you anywhere; if you take one into the alley to neck, tell one of your sisters, and come back as soon as you can. The girls follow these rules and enjoy their nights dancing, coming to be known as “the princesses” at the club, but a few problems arise to complicate their situation. First, their father reads in the newspaper about clubs where gangs of young society women are showing up and dancing, and this makes him suspicious. Second, the Kingfisher club is raided while the girls are there. And third, as the girls get older, the rule about falling in love gets harder to follow. Moreover, Mr. Hamilton decides to start marrying off his girls to men of his own choosing. I absolutely loved this novel. It has drama and humor; even as I sped through it, I regretted that I was getting closer to the end. The writing is wonderful, with each sister and a few other characters getting their own unique voice. Jo, the main character, is especially interesting — a smart and resourceful woman who takes on a leadership role at the expense of her own happiness. At one critical point in the story, the sisters are separated. Jo, alone for the first time in her life, has to reinvent herself and try to track down her siblings. I also enjoyed one particularly humorous scene where Mr. Hamilton holds a dinner for the four men he has chosen for his four eldest daughters. The girls’ preparation for this event is very funny, but I was on the edge of my seat wondering if they would be able to escape these forced arrangements. I’ve read a few novels lately that reimagine fairy tales, and what I love about them is that the female characters are empowered to save themselves, to make their own choices and submit to the consequences instead of fate or someone else’s assistance being foisted upon them. The Girls at the Kingfisher Club fits in with this genre. The fairy tale becomes a love story mostly about sisters and, incidentally, about some of the men they meet; and it’s a story about young women becoming independent and finding happiness in that. I first heard of this book when the Book Smugglers mentioned it, but had completely forgotten about it until I saw your great review. Fairy tale retellings are like catnip to me. I should totally add this to my reading list. Was just looking at my selection of Sevenwaters book and thinking, “boy I could totally use a fantastic fairy tale” (fall has been grey and wet so escapism is a survival skill). This looks great – adding it to my queue. Thanks! Thanks for the comments. I hope you both enjoy this book as much as I did. And if you have any suggestions for other retold fairy tales, I’m all ears! I read “Boy, Snow, Bird” and I’ve heard that Helen Oyeyemi has featured fairy tales in her other novels. Daughter of the Forest has always been a favorite of mine (brothers turned into swans, sister’s struggle to break the curse). Sort of fairy-tale esque I adore Scorpio Races by Maggie Stiefvater (fairy water horses that you catch and race at grave peril). Malin probably has some strong suggestions too? I like Daughter of the Forest, but love Son of the Shadows, the second book in that series even more. It’s still one of my favourite fantasy books. I also really liked Heir to Sevenwaters, the first book in the sequel trilogy. Malin – you are simply a gem! Thanks! These suggestions should take me well into CBR7!